The new level of precision and global coverage provided by satellite altimetry is rapidly advancing studies of ocean circulation. It allows for new insights into marine geodesy, ice sheet movements, plate tectonics, and for the first time provides high-resolution bathymetry for previously unmapped regions of our watery planet and crucial information on the large-scale ocean features on intra-season to interannual time scales. Satellite Altimetry and Earth Sciences has integrated the expertise of the leading international researchers to demonstrate the techniques, missions, and accuracy of satellite altimetry, including altimeter measurements, orbit determination, and ocean circulation models. Satellite altimetry is helping to advance studies of ocean circulation, tides, sea level, surface waves and allowing new insights into marine geodesy. Satellite Altimetry and Earth Sciences provides high resolution bathymetry for previously unmapped regions of our watery planet. 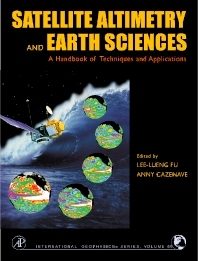 Satellite Altimetry and Earth Sciences is for a very broad spectrum of academics, graduate students, and researchers in geophysics, oceanography, and the space and earth sciences. International agencies that fund satellite-based research will also appreciate the handy reference on the applications of satellite altimetry.